Such a pretty card for the grade. Wow. Hard to imagine another example graded less than a '5' looking this good. A very well centered card with bright white borders and four relatively square corners throughout. We've looked long and hard for the cause of the seemingly harsh grade and have located an exceedingly light crease stemming from the bottom edge as the only flaw. Still seems like a card that could have graded a '4'. 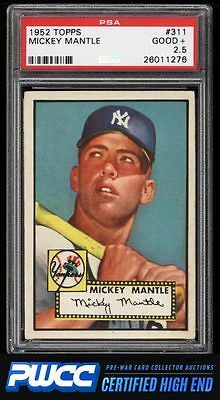 All told this is a steal for the grade One of nearly 17,000 cards, lots, and sets up for bid in our 8th Auction of 2016. Click on the link above to view the other PWCC auction lots.